With the celebration of a new year comes one of the most anticipated events these days: the New Year’s Eve fireworks. These fireworks shows are a common tradition around the world. People love the displays of bright colors and the figures that these pyrotechnic devices generate in the sky. Many others are also excited to hear the thunderous sounds produced by fireworks. But in recent years, there has been a lot of controversy about the use of these little bombs. It has been scientifically proven that fireworks explosions can cause injuries and traumas in both humans and animals. Since then, some people have started to conceive of other types of visual events for these dates—perhaps less harmful but still spectacular. Of those alternative options, we are going to see 10 of the most extreme as well as analyze if they truly are more beneficial. It is said that drones are the future of open-air events as successors of fireworks. In several countries from the United States to China, drones are used as a replacement for fireworks in aerial shows. It is difficult to imagine such small machines occupying the place and the attention of a huge explosion in the sky, but we have to think big. To celebrate the 50th anniversary of the tech company, Intel decided to launch 2,018 drones into the air on its base in California. This gave Intel the world record for simultaneously flying the largest number of unmanned aerial vehicles. During the eight-minute show, drones equipped with multicolored lights formed giant images in the air—from the company’s logo to an impressive Earth globe—all while moving to the rhythm of the background music. The drones were controlled by just one pilot. Intel created drones especially for such aerial shows. In fact, the company has already made similar presentations and plans to keep increasing the scale of its shows in the future. While a handful of drones in the air may not be so striking, thousands of drones with lights dancing in front of us would surely make us change our minds. For many years, an English company called Arcadia has made unique shows for thousands of people. 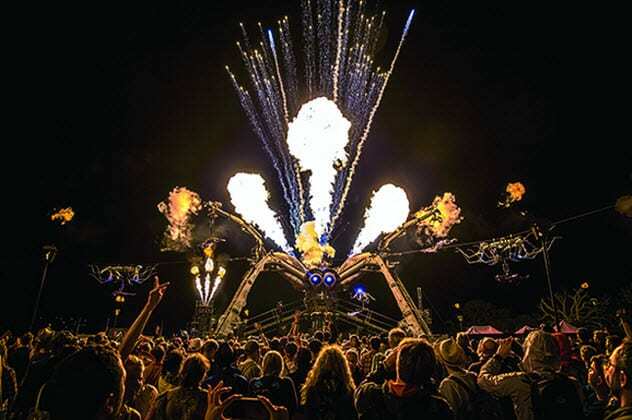 During the annual Glastonbury music festival in England, Arcadia usually presents the next New Year alternative on this list: a flame-throwing giant creature. A 50-ton, 15-meter-tall (49 ft) mechanical spider is on display as the main attraction of the event. From the middle of the crowd, it can fire lasers and giant fireballs into the air. Arcadia built the giant metal spider with the recycled parts of military vehicles, such as aircraft components. The show with this machine can host up to 50,000 people and can be perfectly seen from any angle. Its main fuel for the pyrotechnic shows is biodiesel. Although the spider is Arcadia’s most famous creation, it certainly is not the only one. Another machine called the Afterburner is also made from recycled parts and consists of a rocket-like vertical structure with flamethrowers at the top and a DJ booth in the center. Both the Arcadia Spider and the Afterburner have been in a lot of shows around the world, from America to Asia. If you do not like the idea of welcoming the New Year with a fire-breathing monster in front of you, there are still other flame-throwing options just as interesting. For example, in some places, drones with flamethrowers are used for tasks ranging from cleaning power lines to roasting turkeys. Whatever the choice, we must admit that a machine throwing flames into the sky on New Year’s Eve would be an eye-catching event. Many ideas have been proposed to try to make fireworks less noisy. Perhaps, a solution to this problem would be launching fireworks into the air without firing them. At least that way you avoid the rockets roaring as they go up in the sky. But the explosive ending remains. One way to achieve this would be loading a hot-air balloon with fireworks inside its basket. Although it may seem odd or dangerous, some people already do it every year. Since the 19th century, the inhabitants of Myanmar annually celebrate the Taunggyi Fire Balloon Festival, which is a massive pyrotechnic event. Several teams attach large numbers of fireworks to decorated hot-air balloons and throw them into the air. Once in the sky, the fireworks create a great show of fire, smoke, and vibrant colors. However, there are some serious problems with this practice. On the one hand, it takes a long time for these hot-air balloons to gain altitude, so they tend to glide dangerously close to the people below before ascending. In fact, they sometimes fail to do so. During the festival in 2012, a hot-air balloon loaded with fireworks crashed to the ground in the middle of the crowd. Moments later, the entire load exploded, engulfing onlookers in sparkling fireballs. In other cases, the explosive cargo of the hot-air balloon can break off in mid-flight and fall. In the 2018 celebration, the already-ignited fireworks separated from the balloon and fell to the ground, again onto a lot of people. The result was nine injured and two hospitalized. Inevitably, it seems that keeping the attractiveness of fireworks will always have its risks. There are some options for dealing with a cloudy sky on New Year’s Eve. If the clouds do not let you see the lights, maybe you could project the lights onto the clouds by using them as screens. The idea of projecting images in the clouds has been a challenge for many engineers and inventors. In 2015, British artist Dave Lynch launched a project in which he was able to project a scene of a horse galloping over the sky of Nottingham. To achieve this, he used a special laser projector (called zoopraxiscope) mounted on a small plane and flew over the area to use the clouds as a white screen. But a couple of years before, a group of Japanese experts managed to develop a method to project images onto clouds directly from the ground. The two companies involved, Daikin Industries and teamLab, experimented with custom projectors in a cloudy sky, and the results were successful. They were able to reproduce full-color animations on natural clouds, including a concert of Japan’s virtual idol, Hatsune Miku. Meanwhile, during a night in January 2014, the residents of London could see what seemed to be the bright outline of an airplane moving through the clouds. The image was actually a laser projection made on the occasion of airline Air France’s 80th anniversary. The companies Curb and CMT Events used highly powerful lasers to project the plane in the sky as well as the name of the airline and a hashtag for the celebration. If you can start the new year projecting your name onto the clouds, even Batman will be proud of you. Natural auroras are truly a breathtaking visual spectacle. But this phenomenon usually occurs only at high latitudes near the poles and at specific times of the year according to the solar activity. So, unless everyone travels to countries in the polar circles, auroras are not a viable event to welcome the New Year. Well, they were not until some time ago. But now, we can create auroras on demand. The HAARP program in Alaska consists of a facility with 180 transmission antennas capable of emitting high-intensity radio waves directly to the ionosphere, an upper layer of the atmosphere. The powerful radio waves accelerate the electrons scattered at that height, and their collisions create the characteristic brightness that forms the auroras. The HAARP program has created numerous artificial auroras over the years, some of which have lasted up to an hour. Obviously, these auroras have a reduced size due to the capacity of the antennas, although they are clearly visible to the naked eye in a green tone. 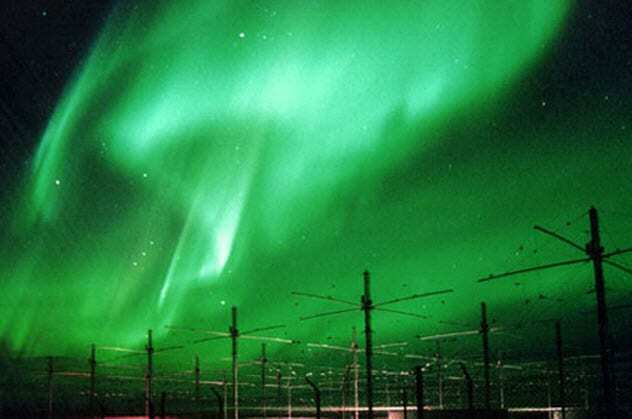 While the best-known artificial auroras are those produced by the HAARP program, the truth is that there are many similar radio transmitters around the world. For example, Russia has a similar program called SURA and the SuperDARN is a program of research antennas across multiple countries. The cost of running an experiment at the HAARP facility is $5,000 per hour. A radio enthusiast paid $1,200 to run a 15-minute experiment, so what is stopping you from blowing up the sky with green lights on New Year’s Eve? If you do not have the necessary resources to build a superexpensive system of radio antennas in your backyard, maybe the next one could be your ideal option. In several provinces of the Netherlands, there is a rural tradition on New Year’s Eve that is far from launching fireworks. The noisy part of the show remains, though. This tradition is at least a century old and is called Carbidschieten (“Carbide Shooting”). The celebration consists of placing a milk churn in an inclined position with a support frame beneath. In this way, the milk churn takes the form of an improvised cannon. Then a chunk of calcium carbide is placed inside with a little water. The lid is immediately placed on the churn again. In there, the wet carbide transforms into acetylene gas, which is highly volatile. Finally, the gas that comes out of a small hole at the bottom of the churn is carefully ignited with a flame. The result is a violent explosion that sends the lid flying extremely far away. On New Year’s Eve, many Carbidschieten competitions are held across the country in which the winner is the one who manages to shoot the churn lid farther. Of course, this option is as noisy and unhealthy as traditional fireworks. But for those who like explosive sounds, it is a perfect alternative. At first glance, throwing balloons into the air seems to be a more peaceful and less harmful kind of celebration than launching explosive rockets. For that reason, many celebrations around the world promote this type of practice. But the problem is that if we all start throwing balloons on New Year’s Eve, there would be millions of balloons roaming the air in a few hours. And that would be truly harmful—to the point that some countries have regulated or banned the mass release of balloons. The reason? Maybe it is better if we understand it with a real example. 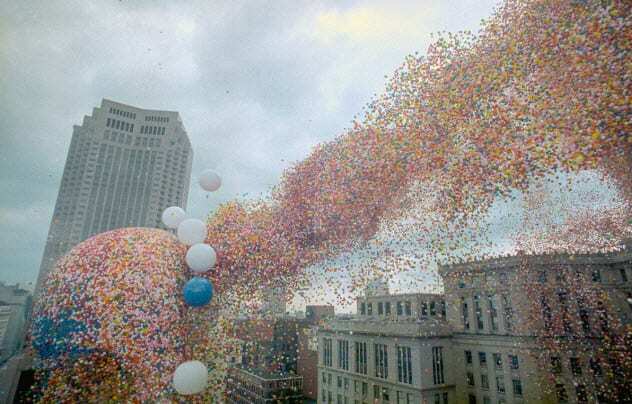 In 1986, the city of Cleveland decided to launch two million helium balloons into the sky to break a world record as well as to raise funds for charity. In the end, due to bad weather, the number was reduced to approximately 1.5 million balloons, deposited under a net the size of a block. In the early afternoon, the helium balloons were launched among the tall buildings of the area. Soon, a storm that was approaching covered the balloons and the rain made them descend back to the city. The still-inflated balloons landed on the surface of Lake Erie next to Cleveland, preventing a search for two missing fishermen who eventually were found dead on the coast. In other regions of the state of Ohio, the balloons scared racehorses, making them suffer serious injuries. As if that were not enough, an airport in Cleveland had to close one of its runways. So, for a small celebration, helium balloons are an interesting option. For New Year’s Eve? Not so much. While skydiving certainly is an adrenaline-producing sport, skydiving at night must be an extreme experience. However, this discipline is frequently practiced by many experts. Although it is a spectacular event for them, it can also be that way for people below them. Sometimes, these skydivers attach handheld magnesium flares to their boots, which leave a bright tail of sparks as the adventurers keep flying. From the ground, these parachuters look like a group of comets crossing the sky with synchronized movements. Skydivers with flares are especially recurrent in football matches. For example, during the Fourth of July celebration in 2018, some residents of Denver were surprised to see some peculiar lights among the fireworks. These lights moved like shooting stars descending slowly. It turns out that the lights were actually a team of four skydivers officially called the Thunderstorm. This group often impresses the crowds every time the Denver Broncos football team plays in its own stadium. Another group, the US Army Golden Knights, usually visits many cities in the United States. They jump from an airplane while equipped with flares. In November 2018, the Golden Knights jumped over Stanford Stadium in California during the last local game of its university. Another team of aviation experts, the Red Bull Air Force, made a parachute jump at night. While most of the skydivers carried a wind sock, one of them had a magnesium flare that left a luminous trail behind him. Skydiving with flares during New Year’s Eve would definitely be an exclusive show for experienced people. It is a little less showy than traditional fireworks, but it is still worth a try. What can you do if New Year’s Eve gets stormy outside? Tempestuous weather can be a letdown for fireworks lovers, but there are other options. However, you may want to enjoy the next alternative from very far away. Scientists at the University of Florida created a device called a “lightning machine.” It is a mechanism composed of a small 1.8-meter-tall (6 ft) rocket connected to the ground by a copper wire 701 meters (2,300 ft) long. When the rocket is launched into the sky during a storm, the wire unrolls and then a lightning bolt falls through it just a few seconds later. So, in essence, it is a flying lightning rod. While a natural lightning strike is unpredictable, scientists are now able to trigger lightning falls any time they want. Undoubtedly, a New Year’s lightning show would be an impressive thing to see. But maybe it would be better to let the experts handle this type of technology, especially since the deadly temperature of a single lightning bolt is almost 30,000 degrees Celsius (54,032 °F). “Shooting stars” are just small space debris burning upon entry into the Earth’s atmosphere. Such debris can be from alien rocks to our own space junk. Most of these bright lights in the sky go unnoticed due to their unpredictable occurrence. But now, we can deliberately create shooting stars with the specific purpose to entertain us. For several years, Japanese company ALE has been developing a program called Sky Canvas. This program consists of launching a satellite, which will be loaded with a thousand metallic pellets, to a height of 500 kilometers (311 miles). When the satellite is over a certain region, it releases the pellets so that they fall to Earth and burn in the atmosphere. In this way, the satellite can produce numerous shooting stars that last up to 10 seconds at any desired time and location. In turn, the pellets will be made of different elements. When burned in the upper atmosphere, they will generate bright colors perfectly visible from the ground. 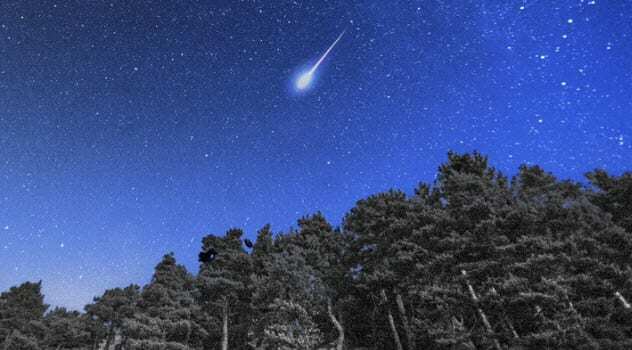 Although each meteor would have a high cost of $8,100, ALE is already preparing to perform a shooting star show at the Tokyo 2020 Olympic Games. If you think fireworks create a great view, imagine starting a new year while watching a dozen multicolored meteors falling in the middle of the night sky. Read more fun facts about New Year’s Day on 10 Ancient New Year Traditions And Stories and Top 10 New Year Traditions.